This paper is an introductory survey of available methods for the computation and representation of probabilistic counterexamples for discrete-time Markov chains and probabilistic automata. In contrast to traditional model checking, probabilistic counterexamples are sets of finite paths with a critical probability mass. Such counterexamples are not obtained as a by-product of model checking, but by dedicated algorithms. We define what probabilistic counterexamples are and present approaches how they can be generated. 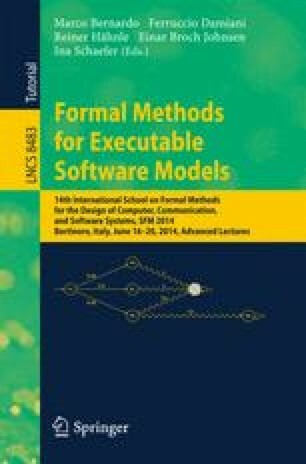 We discuss methods based on path enumeration, the computation of critical subsystems, and the generation of critical command sets, both, using explicit and symbolic techniques.